The International Diabetes Federation (IDF) Diabetes Atlas More Details estimates that the number of adults with diabetes will rise from 415 to 642 million people by 2040, indicating a substantial increase in the number of people living with diabetes. India is home to the second largest number of adults living with diabetes (nearly 69.2 million people) and the second largest number of children with type 1 diabetes (T1D) in the world (70,200), after the USA. In addition, millions of people have impaired glucose tolerance and are at increased risk of developing T2D in the future, largely a consequence of on-going urbanisation and increasing life expectancy. Mortality and morbidity associated with diabetes and its potential complications cause significant healthcare burden on both families and society at large. India was the largest contributor to mortality due to diabetes in the South East Asia Region, with one million deaths attributable to diabetes. Among those diagnosed with the disease, data show that at least half still do not achieve satisfactory glycaemic control, despite the availability of effective treatments. There have been substantial advances in diabetes therapeutics, insulin preparations and insulin delivery systems along with glucose monitoring technology. However, glycaemic control in most T1D and T2D patients is suboptimal. Worryingly, diabetes is now being shown to be associated with a spectrum of complications and to be occurring at a relatively younger age within the country. Hyperglycaemia, hypoglycaemia and glycaemic variability (GV) have been associated with increased morbidity, mortality, length of stay, and cost in a variety of critical care and non-critical care patient populations in the hospital. Reasons for expanding burden of diabetes include rapid urbanisation leading to drastic increase in diabetes in the country, high carbohydrate diet, lack of exercise, delay in diagnosis, patient's compliance issues and lack of substantial guidance by physicians on blood sugar monitoring. If there is any one thing that every physician in the world knows, it is that no two diabetes patients are alike. Every individual comes with a different history, set of clinical symptoms, idiosyncrasies and attitudes. Considering the religious aspects of weekly fasts, festivals, the standard Indian diet rich in carbohydrates and an attitude of non-chalance when it comes to dietary habits, it is easy to see why the Indian adult is more in need of continuous and regular glucose monitoring as compared to his western counterpart. This phenomenon emphasises the need for a patient-centric model of measurement of blood glucose. Despite substantial advances in the insulin preparations and insulin delivery systems along with glucose monitoring technology, glycaemic control in most diabetes patients is suboptimal, so it is very important for an individual with diabetes to be responsible for his blood glucose level and knowledgeable about all the preventive and reliable treatment options. Many medical organisations have established aggressive targets for glycaemic control in individuals with T1D and T2D. However, meeting these targets without undue hypoglycaemia is challenging: glycosylated haemoglobin (HbA1c) levels are above target in most people with diabetes, and severe hypoglycaemia remains an on-going threat to patients. What's more, analysis of glucose levels, even in ‘well-controlled’ patients with T1D and T2D, indicates that significant time is spent above and below desired target ranges. Glucose monitoring is an important component in diabetes treatment and management. The results of blood glucose monitoring (BGM) are useful for determining the degree of glucose metabolic disturbance, evaluating therapeutic outcomes and guiding adjustments of treatment regimens. Self-monitoring of blood glucose (SMBG) still remains the most common form of in-home BGM with the HbA1c as the ‘gold standard’ for understanding the patients' average glucose over the last 3 months., The tools conventionally used to treat and manage diabetes limit our ability to meet glycaemic goals. Point-in-time (finger-stick) blood glucose measurements can be particularly problematic. These readings, typically taken four times daily in those patients on multiple daily doses of insulin, fail to provide key information regarding the context (i.e. direction and recent history) of the blood glucose level. In most cases, they also fail to provide sufficient warning of pending hypoglycaemia or severe hyperglycaemia, thus limiting the patient's ability to take evasive action. SMBG represents only a snapshot of the glucose concentration; thus, it is unable to demonstrate a patient's blood glucose profile for an entire day. User error is still the number one barrier to accurate results in SMBG and user factors that can impact accuracy include improper patient training, use of damaged or expired test strips, un-calibrated metre and inadequate or contaminated blood sample. Clinical evidence gathered from all corners of the globe underlines the importance of GV and its many components, also the fact that irrespective of quantification parameters erratic blood glucose levels lead to clinical worsening and delay in recovery. It is now well established that the increased GV is a strong predictor of hypoglycaemia and is also correlated with poor glycaemic control. 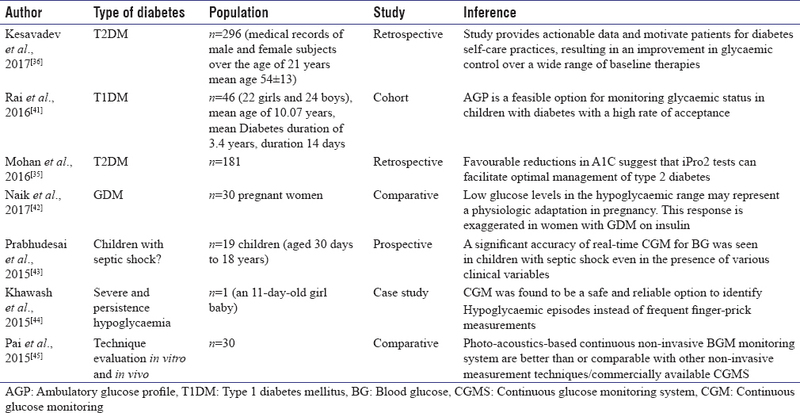 Multicentre, multinational trials such as the STAR-1, STAR-3 and JDRF provide clinical insight into the issue of glucose monitoring and its effect on prognosis.,, [Table 2] and [Table 3] Suboptimal control has been identified by several studies as one of the possible causes of poor outcomes of diabetes care in general practice. This is the most compelling reason to minimise GV today. GV is predictive of patient satisfaction with an intensive insulin regimen. Continuous glucose monitoring (CGM) fulfilled an unmet need in diabetes care which was automated glucose monitoring to improve glucose control in all uncontrolled diabetes patients and patients on intensive glucose lowering regimen; in cases of pregnant women, children and adolescents group, glucose monitoring may also hold its greatest potential in assisting prandial insulin and dietary decisions. Treating T1D in children is challenging for patients, their family members and medical staff, and keeping the blood glucose levels constant within the desired (target) range day and night is almost an impossible mission. In children and adolescents, CGM systems (CGMSs) should provide improved overnight control with hypoglycaemia alarms and retrospective data to optimise overnight basal insulin needs. They also help prevent severe nocturnal hypoglycaemic events. Most importantly, they provide an enhanced understanding of diabetes management teaching to understand effects of different foods, exercise, stress, and menstrual cycles on glucose excursions, which in turn help the adolescent to not only adjust to a lifetime of health restricted diet and exercise practices but also make their lives more like their peers. CGM can provide additional information compared to SMBG. Sensor technology has evolved tremendously in recent years, becoming an effective complement to traditional BGM methods, and has been widely used in the clinical setting. Nevertheless, the advantages, clinical indications, accuracy evaluation of the technology and interpretation of the CGM results are not well known to Indian physicians and patients, limiting its use to only a few centres. Under this circumstance, Diabetes India Task Force of experts took up the task to create the Indian Clinical Guidelines for CGM, in accordance to those published in international guidelines and Indian studies plus clinical experiences to provide the geographic-specific information on CGM for Indian population [Table 1]. CGMS records and displays continuous glucose level, the direction and magnitude of change of glucose levels, using a subcutaneous sensor to monitor interstitial glucose levels. It can be used as a tool to predict impending glucose excursions both hypoglycaemia and hyperglycaemia, with ‘24/7’ coverage to assess GV, which is information that conventional blood glucose metres do not provide. This is executed on a near-continuous basis, throughout the day and across several days, thereby facilitating pattern recognition and helping the patient (and physician) to optimise therapy and improve metabolic control. Currently, available CGM devices are considered minimally invasive and possess enzyme-coated electrodes to measure interstitial glucose concentrations and convert these values to blood glucose levels. Even though the CGM is called continuous, CGM devices sample interstitial fluid glucose intermittently. The recorder receives a signal every 10 s, and the average recorded signal in every 5 min is converted into a blood glucose level and saved. Patients have to wear the recorder for 6–14 days depending on the type of CGM used, during which time a minimum of four fingertip blood glucose readings must be recorded a day to calibrate the device, as well as the factors that can affect blood glucose fluctuations such as meals, exercise, anti-hyperglycaemic drugs and hypoglycaemic events. The latest flash glucose monitoring (FGM) systems do not require finger stick calibration. These devices can display real-time (RT) glucose values and glucose trends, and some can also sound an alarm or vibrate when they detect hyperglycaemia or hypoglycaemia. The recorded readings can be used later, and a pattern of person's glucose levels and fluctuations can be displayed as a line graph, pie chart, table, etc., incorporating the events and times of indicated factors that affected blood glucose. These readings both quantitatively and qualitatively offer not just point and trend accuracy but also numerical and clinical accuracy of the patient's blood glucose levels and fluctuations. RT systems that continuously provide the actual glucose concentration on a display: RT monitoring shows directly to the patient the glucose levels in RT, representing an educational tool for diabetic subjects. It also provides alarms when glucose values are below or above a predetermined level. While false-negative and false-positive alarms are frequent, subjects must detect their glucose level also through the SMBG, although the accuracy these days has tremendously improved. Glucose variability or glucose fluctuations induces oxidative stress and endothelial dysfunction from the overproduction of reactive oxygen species by the mitochondrial electron-transport chain, which is the main underlying mechanism of glucose-mediated vascular damage involved in long-term complications of diabetes. Glucose variability has been considered as a predictor of severe hypoglycaemia because this condition is preceded by glucose disturbances. Glucose excursions are potent activators of oxidative stress, including in T2D patients not on insulin therapy; Monnier et al. showed a positive correlation between glucose excursions evaluated by the mean amplitude glucose excursions and the 24-h urinary excretion of isoprostanes (8-iso-PGF2α), which is considered a good marker of oxidative stress. Ceriello et al. demonstrated that glycaemic spikes are more damaging to the endothelial function than sustained chronic hyperglycaemia. Chang et al. found that both short- and long-term glycaemic excursions could induce oxidative stress and chronic inflammation in T2D. Who will benefit from continuous glucose monitoring? CGM consists of a tiny biosensor needle which is placed subcutaneously measuring interstitial glucose of type 1 diabetes mellitus (T1DM) and T2DM patients who have not achieved their target HbA1c levels or in those who have recurrent hypoglycaemia or who are pregnant. When it comes to intensive diabetes management, information is power. Traditional forms of glucose monitoring provide insufficient information for achieving glycaemic goals in a safe manner. CGM provides immediate, on-going feedback that the user can apply toward reaching desired goals. Two types of diabetes-affected individuals will potentially benefit from CGM. Second, T2D individuals who are dependent on exogenous insulin may also benefit from CGM. This is particularly true if they experience hypoglycaemia when trying to maintain their A1C <7%. CGM in conjunction with intensive insulin regimens can be a useful tool to lower A1C in adults with T1DM as well as in T2DM patients with uncontrolled hyperglycaemia. CGM may be a supplemental tool to SMBG in those with hypoglycaemia unawareness or frequent hypoglycaemic episodes. 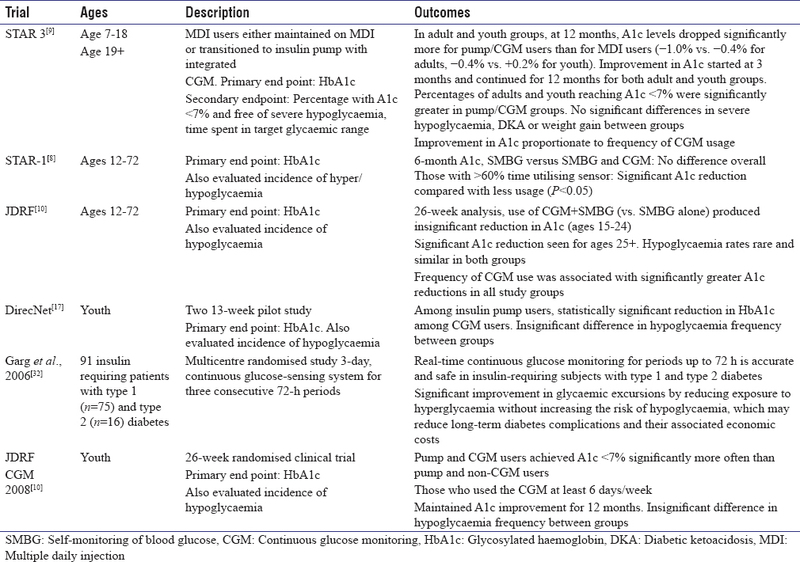 Intermittent use of professional CGM may be useful for youth with T1DM who are experiencing changes to their diabetes regimen or have problems with nocturnal hypoglycaemia/dawn phenomenon, hypoglycaemia unawareness and postprandial hyperglycaemia [Table 4]. CGM has advantages in assessing blood glucose fluctuations and detecting hypoglycaemia, which can be otherwise missed by traditional monitoring methods. To demonstrate postprandial hyperglycaemia, asymptomatic nocturnal hypoglycaemia, the dawn phenomenon, Somogyi effect, etc. To create a patient-centric treatment plan and to enhance treatment compliance. CGM serves as a valuable tool demonstrating significant practical benefits in clinical practice. It also enhances compliance as patients can be shown the immediate impact of lifestyle and medicinal decisions, resulting in significant reduction in glucose variability. On-screen trend graphs allow users to forecast short-term changes to current glucose levels, thus improving decision-making capabilities. Retrospective analysis can allow clinicians to discriminate between traditional hyperglycaemia and rebound from hypoglycaemia. What is the Specific Role of Continuous Glucose Monitoring in Type 2 Diabetes? T2D is in epidemic proportion in India and the main target of diabetes management should focus on achieving near-normoglycaemic values reducing the risk of hypoglycaemia, thereby minimising glucose variability. Reduction of glucose variability represents the main challenge of T2D management. CGM is the best method to evaluate the intra-day, inter-day and postprandial glucose (PPG) variability as well as the amplitude and the speed of glycaemic swings. The use of CGM may reduce glucose variability, prevent long-term complications and lead to improved glycaemic control also in elderly T2D patients. CGM reveals information on PPG levels, nocturnal or unawareness of hypoglycaemia and on hyperglycaemic spikes not previously detected by SMBG. CGM is also effective as a motivational device in poorly controlled T2D patients. It has been used to assess the effect of acute psychological stress in T2D. What is the Role of Different Software in Continuous Glucose Monitoring Reporting and What are the Insights that they Offer? The contents and formats of CGM reports are not unified. A regulated CGM report should contain general information such as basic patient information, clinical diagnosis, signature of reporting personnel and the date of the report as well as the CGM results. Specialised software for CGM management has been developed to relieve doctors from complicated work. Most common ones include iProLink, CareLink and ambulatory glucose profile (AGP). Each one of them is unique in terms of the report generated. From the time that CGM was introduced, it has evolved. Accuracy of the current CGMS have significantly increased and it continues to improve. Size, weight, complexity and cost of CGM sensors/devices have decreased, whereas the duration of use, specificity, user-friendliness, user interface and displays, data management and software for data analysis have improved. It serves as a blueprint for a patient's current glycaemic control, which can be used to recommend the adjustments in the patient's therapy. CGM reports can be used as a valuable educational tool to help patients understand the impact of diet, medication and exercise on glucose control. iPro enables healthcare professionals (HCPs) to obtain a better understanding of their patient's metabolic fluctuations and support appropriate therapeutic interventions, leading to improved glycaemic control. iPro provides HCPs with insights and opportunities for initiating changes to treatment regimens and to diet and exercise behaviours and provides patients with improved knowledge of the importance of therapy compliance. Patient log sheet, which is an important information source to be used in conjunction with the data provided by the four iPro CGM reports. CareLink software is a tool that allows reporting based on important information about insulin dosage, carbohydrate intake, sensor glucose and blood glucose readings, all in one place. CareLink users, their parents and diabetes care providers have the additional benefit of an organised software program to view and analyse data. The advantage of the CareLink system is that an accurate daily log of blood sugars, insulin doses and carbohydrate grams is available to the diabetes care provider, the parent and the child. The challenge that remains is to convince parents, patients and providers to view these data on a regular basis so that they can be used to adjust and evaluate therapy. CareLink Therapy Management Software for Diabetes allows information stored in insulin pumps, CGM devices and blood glucose metres to be uploaded and analysed retrospectively by HCPs; they can retrieve these data through CareLinkPro, which allows them to interpret reports and suggest therapy adjustments. Use of the CareLink system has been associated with improved glycaemic control in children with T1D on insulin pump therapy. The therapy management dashboard provides an overview of glycaemic control, insulin delivery and key pump settings. Pattern tables identify repeated episodes of hypoglycaemia and hyperglycaemia. Sensor use data include average sensor glucose values and the average number of high/low threshold and predictive alarms per day. AGP reports can visually help simplify complex data and give meaningful insights that make clinical decision-making easier. To produce an AGP report, the software combines all CGM data from several days or weeks into a single 24-h period. The programme then applies mathematical algorithms to help present glycaemic patterns. The first component of the AGP to be plotted is the median curve (50th percentile), which shows the median glucose value for every time point and is a representation of glucose stability. The curves immediately above and below the median curve define the interquartile range (IQR). The IQR is used to represent glucose variability as it shows the span of 50% of glucose values. The 10th and 90th percentile curves – the two curves on either side of the IQR – track glucose excursions. Thus, when the five curves appear close, there is a high degree of certainty that the variability will be low. By representing the glucose values in this way, the AGP visually and statistically portrays overall diurnal glucose characteristics of glucose exposure, variability and stability, and hence, it is possible to rapidly determine whether there is an underlying pattern. Similarly, Kesavadev et al. highlighted that FGM using professional version, FreeStyleLibrePro (FSLP), without patient interaction or finger-prick calibration, captures comprehensive glucose data, as a 24-h modal day format, reveals GV and highlights areas which require immediate attention. Anjana et al. showed the impact of this monitoring in patient care as their study highlighted that FGM-based AGP with FSLP is associated with significant reductions in A1c levels in both T1D and T2D. In addition, improvement in A1c levels was maintained across all age groups and in patients enrolled at different diabetes clinics in India. All the major associations have in the past few years released guidelines and recommendations based on various studies and expert views, highlighting the importance of glucose monitoring in the management of diabetes. Committed families of young children (younger than 8 years), especially if the patient has problems with hypoglycaemia. Have A1C levels <7% and wish to maintain target glycaemic control while limiting hypoglycaemia risk. People with occupational risks that enhance possible risks from hypoglycaemia (for example, involving driving or operating hazardous machinery). The intermittent use of CGMSs designed for short-term retrospective analysis in paediatric patients with diabetes for whom clinicians worry about nocturnal hypoglycaemia, dawn phenomenon and postprandial hyperglycaemia; in patients with hypoglycaemic unawareness and in patients experimenting with important changes to their diabetes regimen (such as instituting new insulin or switching from multiple daily injections [MDIs] to pump therapy). These devices represent an alternative for patients who cannot safely and effectively take advantage of the information provided to them by RT-CGM. The intermittent use of CGMSs designed for short-term retrospective analysis may be of benefit in adult patients with diabetes to detect nocturnal hypoglycaemia, the dawn phenomenon and postprandial hyperglycaemia and to assist in the management of hypoglycaemic unawareness and when significant changes are made to their diabetes regimen (such as instituting new insulin or switching from MDI to pump therapy). Canadian Diabetes Association Clinical Practice Guidelines Expert Committee on Monitoring Glycemic Control 2013 recommends in people with T1D, RT-CGM may be used to improve glycaemic control and reduce hypoglycaemia. Kesavadev et al. proposed consensus guidelines for glycaemic monitoring in T1DM/T2DM and gestational DM. Stringent monitoring of blood glucose in diabetes plays an important role as the treatment. BGM strategies such as measurement of Hb1Ac, SMBG and CGM play a vital role in achieving the important goal of preventing long-term complications of diabetes. There is no consensus on the utility of CGM in India; hence, there is a need to develop guidance for uniform monitoring mechanism. The DIAMOND study included 158 patients with T1D who were using multiple daily insulin injections and had baseline HbA1c levels of 7.5%–9.9%. They were randomly assigned to either CGM (105 patients) or self-monitoring (53 patients). After 24 weeks, the average HbA1c reduction was 1.0% in the CGM group and 0.4% in the control group (−0.6% [95% confidence interval −0.8% to −0.3%]; P < 0.001). At the end of the study, 18% of the CGM group and 4% of the usual care group had HbA1c levels below 7.0% (P = 0.01). The average duration of hypoglycaemia (glucose values lower than 70 mg/dL) was 43 min a day in the continuous care group and 80 min a day in the control group. Severe hypoglycaemia events occurred in two participants in each group. The GOLD study was a crossover randomised trial involving 161 Swedish patients who were using multiple daily insulin injections and had baseline HbA1c levels of at least 7.5%. The patients were randomly assigned to treatment using a CGMS or conventional treatment for 26 weeks, separated by a washout period of 17 weeks. The study found that average HbA1c was 7.92% with CGM use and 8.35% with conventional treatment (mean difference −0.43% [−0.57% to −0.29%]; P < 0.001). It also found that subjective well-being and treatment satisfaction were greater during CGM than with conventional treatment. Garg et al. have demonstrated an improvement on glycaemic excursion in insulin-treated T2D patients using RT-CGM, showing a significant reduction of the time spent in hypo- and hyper-glycaemic range with an increased time spent in the target glucose range as well as a significant reduction of nocturnal hypoglycaemia in the RT-CGM group. CGM has been compared with the SMBG in T2D patients not on prandial insulin and it was found that short-term intermittent use of RT-CGM has been effective in improving glycaemic control over a 12-week period, without increasing the risk of hypoglycaemia. The effectiveness of RT-CGM was sustained during the40-week follow-up period compared with SMBG, without a greater intensification of medication over the course of the study. CGM was used to obtain data on the various GV indices so as to compare the effectiveness of the different oral hypoglycaemic agents; CGM has been used to study the effect of acute psychological stress on FPG as well as on PPG in T2D and it was found that the acute psychological stress significantly increases glucose concentrations, mainly in the postprandial period. Furthermore, through its use a relationship between cognitive performance and fasting-state/PPG spikes before and after 2 months of calories – restricted diet has been demonstrated in individuals with T2D. Yoo et al. investigated the use of RT-CGM as a motivational device in poorly controlled T2D subjects, demonstrating that the RT-CGM is useful in modifying a subject's diet and exercise habits as well as in inducing improvement of glycaemic control when compared to SMBG. This evidence was further confirmed by Allen et al., where the effect of CGM in addition to a counselling intervention on physical activity habits was evaluated in non-insulin-treated T2D subjects. After an 8-weeks period, the subjects in the intervention group showed significant increases in moderate-activity minutes. Mohan et al. evaluating the use of retrospective CGM concluded that it can effectively help HCPs with insights, opportunities for initiating changes to treatment regimens and to diet and exercise behaviours and provided patients with improved knowledge of the importance of therapy compliance by demonstrable reductions in A1C. Kesavadev et al. performed a retrospective, blinded evaluation of glycaemic control in 296 T2DM adults for 6 months following a 6–7-day study of their glycaemic profile using masked professional (masked) CGM (P-CGM). P-CGM revealed that the predominant pattern of hyperglycaemia was postprandial while previously unknown hypoglycaemia was found in 38% of the patients; over half of the cases of hypoglycaemia were nocturnal. The mean A1C of the P-CGM group dropped from 7.5% ± 1.4% at baseline vs. 7.0% ± 0.9% at 6 months (P < 0.0001). The frequency of performing SMBG was also found to be significantly increased in these patients from the baseline. P-CGM provided actionable data and motivated patients for diabetes self-care practices, resulting in an improvement in glycaemic control over a wide range of baseline therapies. What is the Place in Therapy of Continuous Glucose Monitoring in Diabetes Care? Diabetes as a condition has vast variation in terms of patient profile. Expectations from CGM in each patient will be different. In addition, due to fast changing and evolving technology, one cannot expect perfect concordance in various studies done due to variance in experimental design and protocols, variability in the implementation of the protocol, choice of end points and random statistical fluctuations. These, with each patient being different, contribute to the heterogeneity of results. CGM represents a reliable monitoring tool to minimise GV and to achieve glycaemic targets both in T1D and T2D. It also acts as a motivational device to change patients' lifestyle. When evaluating a CGM technology, the outcome evaluation should be done based on assessing whether the introduction of CGM has resulted in a decrease in risk of hypoglycaemia and whether the managing levels of HbA1c or target levels have been achieved. CGM is recommended for short-term retrospective CGM in certain clinical situations such as to detect nocturnal hypoglycaemia, to assist in the management of hypoglycaemic unawareness and when significant therapeutic changes are performed. In fact, the availability of continuous glucose data for diabetes patient with low- and high-glucose alerts may detect unrecognised hypoglycaemia and hyperglycaemic excursions, aiding in therapeutic changes as well as a prescribing variations in diet and physical activity, thereby modifying diabetes care outcomes. CGM can also be applied to other endocrine and metabolic disorders including insulinoma. We thank Mamta Jain of Medwiz Healthcare Communications, Mumbai, India, for providing medical writing support/editorial support of the manuscript. Ogurtsova K, da Rocha Fernandes JD, Huang Y, Linnenkamp U, Guariguata L, Cho NH, et al. IDF diabetes atlas: Global estimates for the prevalence of diabetes for 2015 and 2040. Diabetes Res Clin Pract 2017;128:40-50. South-East Asia. 7th ed. IDF Diabetes Atlas. Available from: https://www.worlddiabetesfoundation.org/sites/default/files/SEA.pdf. [Last accessed on 2018 Sep 01]. Guariguata L, Nolan T, Beagley J, Linnenkamp U, Jacqmain O, editors. IDF Diabetes Atlas. 6th ed. International Diabetes Federation; 2013. Ross SA. Breaking down patient and physician barriers to optimize glycemic control in type 2 diabetes. Am J Med 2013;126:S38-48. Dungan KM, Binkley P, Nagaraja HN, Schuster D, Osei K. The effect of glycaemic control and glycaemic variability on mortality in patients hospitalized with congestive heart failure. Diabetes Metab Res Rev 2011;27:85-93. Sacks DB, Bruns DE, Goldstein DE, Maclaren NK, McDonald JM, Parrott M. Guidelines and recommendations for laboratory analysis in the diagnosis and management of diabetes mellitus. Diabet Care 2002;25:750-86. Jia WP. Chinese clinical guideline for continuous glucose monitoring (2012). Chin Med J (Engl) 2012;125:4167-74. Hirsch IB, Abelseth J, Bode BW, Fischer JS, Kaufman FR, Mastrototaro J, et al. Sensor-augmented insulin pump therapy: Results of the first randomized treat-to-target study. Diabetes Technol Ther 2008;10:377-83. Bergenstal RM, Tamborlane WV, Ahmann A, Buse JB, Dailey G, Davis SN, et al. Effectiveness of sensor-augmented insulin-pump therapy in type 1 diabetes. N Engl J Med 2010;363:311-20. Juvenile Diabetes Research Foundation Continuous Glucose Monitoring Study Group, Tamborlane WV, Beck RW, Bode BW, Buckingham B, Chase HP, et al. Continuous glucose monitoring and intensive treatment of type 1 diabetes. N Engl J Med 2008;359:1464-76. De Block C, Manuel-y-Keenoy B, Van Gaal L. A review of current evidence with continuous glucose monitoring in patients with diabetes. J Diabetes Sci Technol 2008;2:718-27. Monnier L, Mas E, Ginet C, Michel F, Villon L, Cristol JP, et al. Activation of oxidative stress by acute glucose fluctuations compared with sustained chronic hyperglycemia in patients with type 2 diabetes. JAMA 2006;295:1681-7. Ceriello A, Esposito K, Piconi L, Ihnat MA, Thorpe JE, Testa R, et al. Oscillating glucose is more deleterious to endothelial function and oxidative stress than mean glucose in normal and type 2 diabetic patients. Diabetes 2008;57:1349-54. Chang CM, Hsieh CJ, Huang JC, Huang IC. Acute and chronic fluctuations in blood glucose levels can increase oxidative stress in type 2 diabetes mellitus. Acta Diabetol 2012;49 Suppl 1:S171-7. Graveling AJ, Frier BM. Driving and diabetes: Problems, licensing restrictions and recommendations for safe driving. Clin Diabetes Endocrinol 2015;1:8. Inkster B, Frier BM. Diabetes and driving. Diabetes Obes Metab 2013;15:775-83. Fiallo-Scharer R; Diabetes Research in Children Network Study Group. Eight-point glucose testing versus the continuous glucose monitoring system in evaluation of glycemic control in type 1 diabetes. J Clin Endocrinol Metab 2005;90:3387-91. Wagner J, Tennen H, Wolpert H. Continuous glucose monitoring: A review for behavioral researchers. Psychosom Med 2012;74:356-65.
iPRO TM 2 Professional Continuous Glucose Monitoring System. Available from: https://www.hcp.medtronic-diabetes.com.au/sites/default/files/ipro2_step_by_step_guide_aug18_final.pdf. [Last accessed on 2018 Oct 24]. Getting Started WithCarelink® Personal Software. Available from: https://www.medtronicdiabetes.com/sites/default/files/library/download-library/workbooks/GSG-CareLink-web.pdf. [Last accessed on 2018 Oct 24]. About AGP – The Single Page Report for Everyone. Available from: http://www.agpreport.org/agp/about. [Last accessed on 2018 Oct 24]. Chawla M, Gupta P, Kachalia S, Aversekar S, Wadhwa N. Flash glucose monitoring in type 1 and type 2 diabetes patients – The first Indian experience of libre pro. Pediatric Diabetes. Vol. 17. Pittsburgh, USA: Wiley Blackwell; 2016. p. 12. Kesavadev J, Shankar A, Ashok AD, Srinivas S, Ajai NA, Sanal G, et al. Our first 825 T2DM patients on 14-day factory-calibrated glucose monitoring system: Clinical utility and challenges. J Diabetes Sci Technol 2018;12:230-1. Anjana RM, Kesavadev J, Neeta D, Tiwaskar M, Pradeepa R, Jebarani S, et al. Amulticenter real-life study on the effect of flash glucose monitoring on glycemic control in patients with type 1 and type 2 diabetes. Diabetes Technol Ther 2017;19:533-40. Bailey TS, Grunberger G, Bode BW, Handelsman Y, Hirsch IB, Jovanovič L, et al. American association of clinical endocrinologists and American College of Endocrinology 2016 outpatient glucose monitoring consensus statement. Endocr Pract 2016;22:231-61. Phillip M, Danne T, Shalitin S, Buckingham B, Laffel L, Tamborlane W, et al. Use of continuous glucose monitoring in children and adolescents (*). Pediatr Diabetes 2012;13:215-28. Klonoff DC, Buckingham B, Christiansen JS, Montori VM, Tamborlane WV, Vigersky RA, et al. Continuous glucose monitoring: An endocrine society clinical practice guideline. J Clin Endocrinol Metab 2011;96:2968-79. Canadian Diabetes Association Clinical Practice Guidelines Expert Committee, Berard LD, Blumer I, Houlden R, Miller D, Woo V. Monitoring glycemic control. Can J Diabetes 2013;37 Suppl 1:S35-9. Kesavadev J, Sadikot S, Wangnoo S, Kannampilly J, Saboo B, Aravind SR, et al. Consensus guidelines for glycemic monitoring in type 1/type 2 and GDM. 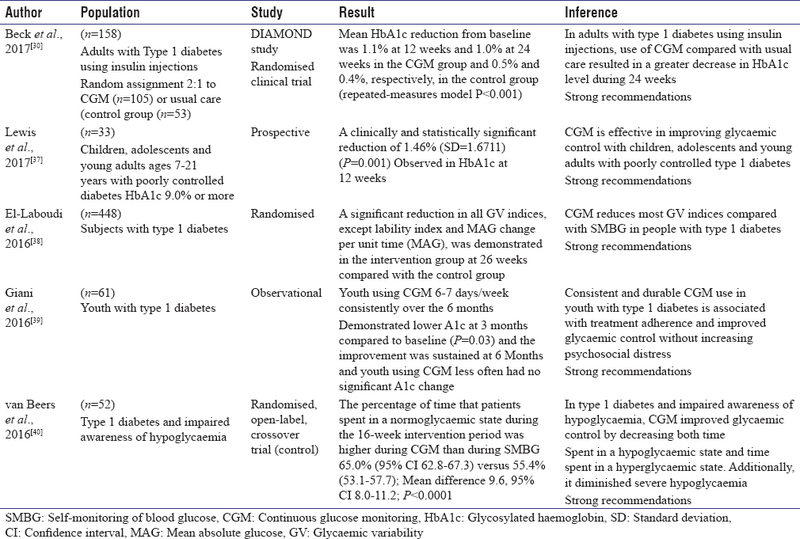 Diabetes Metab Syndr 2014;8:187-95. Beck RW, Riddlesworth T, Ruedy K, Ahmann A, Bergenstal R, Haller S, et al. Effect of continuous glucose monitoring on glycemic control in adults with type 1 diabetes using insulin injections: The DIAMOND randomized clinical trial. JAMA 2017;317:371-8. Lind M, Polonsky W, Hirsch IB, Heise T, Bolinder J, Dahlqvist S, et al. Continuous glucose monitoring vs. conventional therapy for glycemic control in adults with type 1 diabetes treated with multiple daily insulin injections: The GOLD randomized clinical trial. JAMA 2017;317:379-87. Garg S, Zisser H, Schwartz S, Bailey T, Kaplan R, Ellis S, et al. Improvement in glycemic excursions with a transcutaneous, real-time continuous glucose sensor: A randomized controlled trial. Diabetes Care 2006;29:44-50. Yoo HJ, An HG, Park SY, Ryu OH, Kim HY, Seo JA, et al. Use of a real time continuous glucose monitoring system as a motivational device for poorly controlled type 2 diabetes. Diabetes Res Clin Pract 2008;82:73-9. Allen NA, Fain JA, Braun B, Chipkin SR. Continuous glucose monitoring in non-insulin-using individuals with type 2 diabetes: Acceptability, feasibility, and teaching opportunities. Diabetes Technol Ther 2009;11:151-8. Mohan V, Jain S, Kesavadev J, Chawla M, Mutha A, Viswanathan V, et al. Use of retrospective continuous glucose monitoring for optimizing management of type 2 diabetes in India. J Assoc Physicians India 2016;64:16-21. Kesavadev J, Vigersky R, Shin J, Pillai PB, Shankar A, Sanal G, et al. Assessing the therapeutic utility of professional continuous glucose monitoring in type 2 diabetes across various therapies: A retrospective evaluation. Adv Ther 2017;34:1918-27. Lewis KR, McCrone S, Deiriggi P, Bendre S. Effectiveness of continuous glucose monitoring in children, adolescents, and young adults with poorly controlled type 1 diabetes. J Spec Pediatr Nurs 2017;22. El-Laboudi AH, Godsland IF, Johnston DG, Oliver NS. Measures of glycemic variability in type 1 diabetes and the effect of real-time continuous glucose monitoring. Diabetes Technol Ther 2016;18:806-12. Giani E, Snelgrove R, Volkening LK, Laffel LM. Continuous glucose monitoring (CGM) adherence in youth with type 1 diabetes: Associations with biomedical and psychosocial variables. J Diabetes Sci Technol 2017;11:476-83.
van Beers CA, DeVries JH, Kleijer SJ, Smits MM, Geelhoed-Duijvestijn PH, Kramer MH, et al. Continuous glucose monitoring for patients with type 1 diabetes and impaired awareness of hypoglycaemia (IN CONTROL): A randomised, open-label, crossover trial. Lancet Diabetes Endocrinol 2016;4:893-902. Rai S, Hulse A, Kumar P. Feasibility and acceptability of ambulatory glucose profile in children with type 1 diabetes mellitus: A pilot study. Indian J Endocrinol Metab 2016;20:790-4. Naik D, Hesarghatta Shyamasunder A, Doddabelavangala Mruthyunjaya M, Gupta Patil R, Paul TV, Christina F, et al. Masked hypoglycemia in pregnancy. J Diabetes 2017;9:778-86. Prabhudesai S, Kanjani A, Bhagat I, Ravikumar KG, Ramachandran B. Accuracy of a real-time continuous glucose monitoring system in children with septic shock: A pilot study. Indian J Crit Care Med 2015;19:642-7. Khawash P, Hussain K, Flanagan SE, Chatterjee S, Basak D. Nifedipine in congenital hyperinsulinism – A case report. J Clin Res Pediatr Endocrinol 2015;7:151-4. Pai P, Sanki P, Banerjee S. A Photoacoustics Based Continuous Non-Invasive Blood Glucose Monitoring System. 2015 IEEE International Symposium on Medical Measurements and Applications, MeMeA 2015 – Proceedings; 2015. Hulse A, Rai S, Prasanna Kumar KM. Evaluation of accuracy of ambulatory glucose profile in an outpatient setting in children with type 1 diabetes. Indian J Endocrinol Metab 2016;20:643-7.